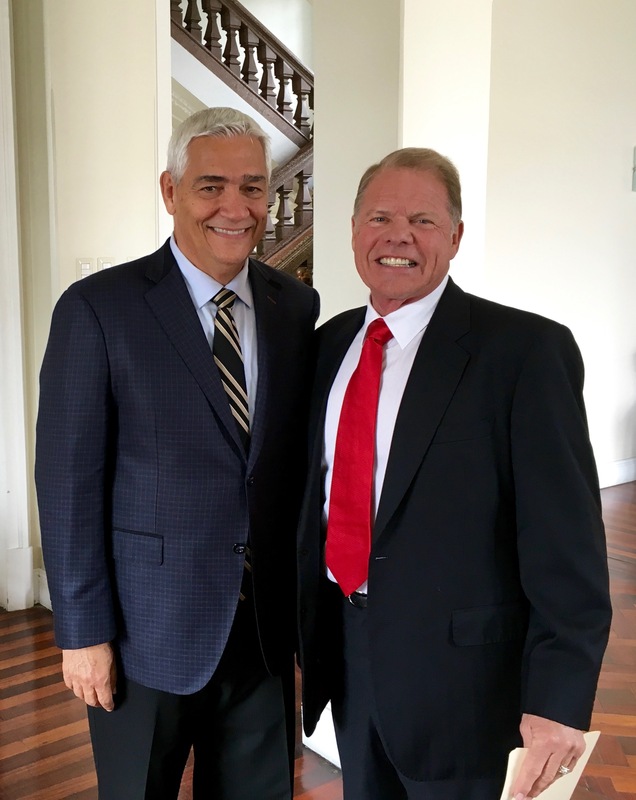 A year or so ago Jerry Anderson, our Global Priority President met Bishop Ray in West Palm Beach. The Bishop heard all about GPS and came to Ohio to be certified as a facilitator. 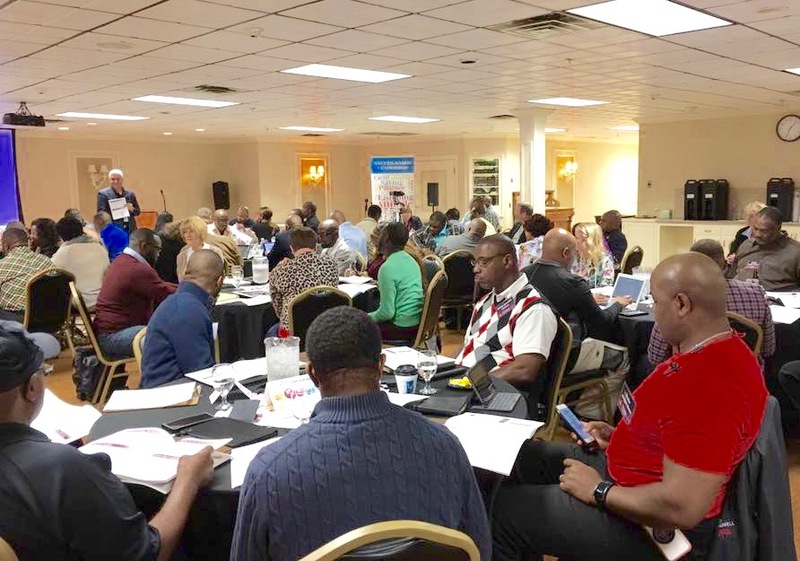 From that contact Jerry was invited to the U.N. to speak to the Global United Fellowship of Afro-American Bishops (a bishop means they have more than one church) who came from all around the U.S., The Bahamas and other countries. For several hours they discussed inner city, social, political and family concerns. Jerry was told beforehand that he had 12 minutes to share at the end. Just before he was asked to come up to speak they took a break and then they sang a song, bringing a change in atmosphere for which he was very grateful! He spoke his 12 minutes and was on his way to his seat when he was asked to return to the podium. Jerry had spoken about solutions and they were so impressed with the message, that he was given another 20 minutes to speak. Jerry sensed the Lord say to him to invite this group of 120 men and women to Ohio to the GPS headquarters. When asked who would like to go, every hand went up. At this point Jerry also felt the Lord tell him to underwrite all the cost of the rooms and meals. It turned out that the only dates that were convenient for them was October 31 to November 2, one of the busiest times of the year for Jerry’s hotel. There may be some rooms available, but certainly not enough for the whole group, he checked with his manager who was also doubtful. But when she checked, to her surprise there was not one room booked yet for those dates. God was certainly in this meeting. 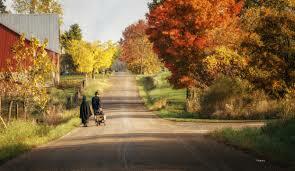 Everyone arrived on October 31st in Amish country for this Pastoral Training Retreat. We began by singing which knit our hearts together immediately. The Presiding Bishop, Bishop Ellis from The Bahamas spoke about the 7 mountains which form a society – business, government, the arts (includes sports), family, religion, media and education. Then our team spoke about values and principles. Transformation begins with the individual and then individuals start to influence the people around them on whatever mountain they are on in a society. We did Round Tables together, sang some more, ate together and made many new friends. One evening we visited the Behalt Museum which traces the history of the Mennonites and Amish from the Ana Baptists in Europe. The mural actually starts with the history of the church beginning with Christ and continues through Martin Luther and the 95 Thesis, the Baptist movement and the separation of the Mennonites and Amish churches. 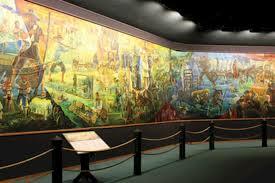 It’s a 10 feet by 265 feet circular mural depicting 1200 historical people. The artist was born in Germany and was drafted into Hitler’s army at 15. He was injured and repulsed by the war, eventually immigrating to Canada. While visiting Holmes County, Ohio he discovered that he spoke the same language as the Amish. Intrigued with their peaceful way of life and denouncement of war, Heinz moved there in 1972. He began painting the mural which took 14 years to complete. What a labor of love and what a treasure! A side note: During the 14 years before the museum that houses the painted mural was built, there were some difficulties and the paintings were in danger of being ruined. Pastor Dave, a dear friend from the community actually took a 2nd mortgage out on his own home to make sure the paintings were stored properly and supported the now elderly Heinz while he continued to work on the mural. Today it is housed in a beautiful round building especially built for the paintings and people from around the world come to see this beautiful piece of artwork. 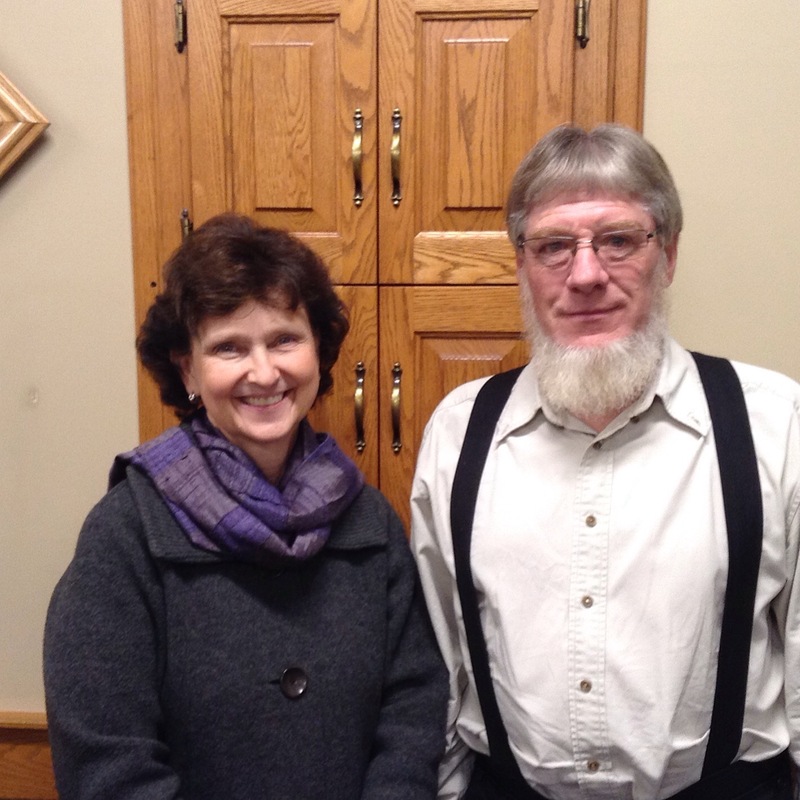 Lester, the Amish man who gives the tours at Behalt. The group of Bishops who came to Ohio came to discuss a different way of doing things to bring about needed change in our society. 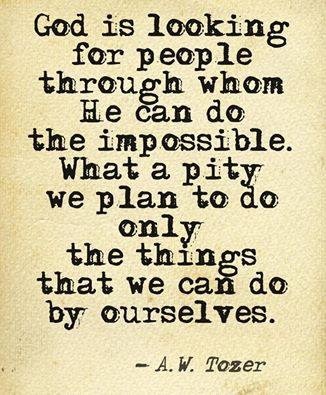 If we keep doing what we’ve always done, we will get what we’ve always gotten. Change is not easy, it takes commitment to not be complacent and comfortable in old habits. It takes courage and strength to adjust. Change just for the sake of change is not always good, but recognizing when things are not working and making intentional decisions to adjust and improve things is wise. As individuals lineup to universal values, and as a result influence others, change will happen in families, communities, cities and our nations. As we rely on God to help us make the changes necessary to grow and mature in our character, we can be salt and light in our world. This is not comfortable, it takes humility to acknowledge our shortcomings, to ask for forgiveness, to turn the other cheek, to not judge or criticize, to not be lazy, to tell the truth, to have a good attitude even when it isn’t fair. Our nature is to justify ourselves and not face reality. We judge others by their actions and ourselves by our intentions. But we have a mind and we can decide to keep lining up to God’s values and then share the source of these values and where the strength comes from to make lasting change in our own life. Religion doesn’t do that for us, community groups or society clubs aren’t enough. We have to have our own connection to God through His Son Jesus. He paid the ultimate price for us with His life to overcome sin and make a way for us to also overcome our sinful nature. There is hope for each of us and for our world. This is not a one time thing, something you did as a kid, it is a continual effort, a continual lining up to the values, a daily practice. We forget so easily and get distracted so often that we need that daily reminder, that connection to God through reading the words He gave to us in the Bible to keep us mindful of His ways – which bring with it blessing. It’s not just the big things, don’t kill, commit adultery, steal, cheat, lie, but the small daily choices we make. Small changes over time bring great change. If we don’t make the small daily adjustments, we won’t have the strength to make the big decisions when they come along. The only absolute we have in our changing society is God’s word. God help me to be a lover of your Word and apply its truth to my life daily with the help of The Holy Spirit and your son Jesus Christ.